Every day when I send out diet charts to my clients, a lot of them reply asking if they can buy ready-mix soups or drink takeaway soups as it is cumbersome to make. This mixed vegetable soup for weight loss is so easy to make and it gets ready in almost no time. Ready-made soup mixes have a lot of preservatives and sodium, which only makes you gain on water weight. So instead of losing weight, you might end up feeling bloated. The best way to lose weight is have simple home made soups. Here is the recipe of mix vegetable soup. – In a pressure cooker, put all the veggies ( cut in large pieces) except corn. Add 1.5 glass of water, 1 tsp salt and cinnamon stick. and let it cook for 3 whistles. – Cool it , remove the cinnamon stick and then grind in a mixer. You can keep the same water from the pressure cooker separately to be added later. 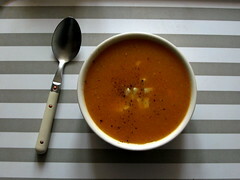 – You can either strain this puree or let it be and enjoy the healthy benefits of fibre this unstrained soup provides. I prefer it unstrained. – In a pan, heat 1/4th tsp butter, add cardamom and cloves, add the vegetable puree , add the remaining water from the pressure cooker, add salt, chaat masala, roasted jeera powder and sugar. – Add the steamed corn kernels and coriander leaves to this soup and serve hot . Enjoy this yummy mix vegetable soup for weight loss when on diet, and you would really feel that dieting is not about starving, but having such delicious healthy drinks. I had veg.soup in my dinner on 4th day as it was mentioned on 1site. But u said we should not have veg soup on 4th day. So now ?…. Mam on my 3 rd dae tmrw n following vry strictly bt no weight loss at all…m feelng low ,why nt few grams also nt reduced? are yu on medications or menstrual cycle ? yes you can . but make sure you finish the prescribed milk and banana. I’m in my fourth day today. Diet is going good. But my cycle started 4 days in advance.. so what now? And also I take thyronorm 100 mcg every morning… can I take a little cabbage in my mix veg soup? Pls reply. Thank you. yes you can add just a little cabbage . now that you are half way daone , and the most difficult part done , you should continue with the diet plan . Hey..im pinky 21yr..I have just started my menstrual cycle today..so cam I start this gm diet from tomorrow or it will cause any harm to my body or any discomfort during the diet week? Plzz help..Thanks. . 1. Can i have lauki/red or yellow pumpkin on the vegetable days? 2. Instead of the soup mentioned, can i make lauki/cabbage soup and have that for dinner on all of the 7 days? 3. can we have sprouts? and if yes, which of the days can that be consumed? Can we have knor soup in our diet? Ur article towards weight loss are awesome. Keep going. I am mother of one and half year old baby, I put on weight after my delivery especially on my hip and thighs. I m trying to reduce my weight by eating healthy and so for achieved reasonable weight loss. I go for 40 mins walk 5 days in a week. plz suggest me a diet which will reduce the fat deposition in hip and thighs. small suggestion if u can specify the calories of recipes then it would be more helpful on dieting. mam I want to lose my weight please can u sugest me some diet plan and I am a working lady. Greatly inspired by your posts and the GM diet plan. I am into menopause and the metabolism is very low. I am on the 3rd day of the diet. No hunger pangs or cravings but have a slight nagging headache all day. Is it ok to have tea (less milk) without sugar? 5/6 day can I have sprouts/dal ? yes you can have tea withour sugar . and yes you can have sprouts and dal on day 5 and 6 , as these are protein days.